Yesterday the Supreme Court ruled on health care, and now every one is arguing about what this means for health care. The problem is that we are not arguing about health or health care at this point. Health care is what we do to our selves and our bodies through out life. By the time you need to use your health insurance it is no-longer health care it is sick care. Once you are in pain or organs stop functioning you are no-longer healthy you are sick. It should not be called health insurance it should be called sick insurance. The real key to cutting health care costs is to stay well not tho treat illness. The big lie is that health insurance companies and the pharmaceutical companies promote health they do not. They prey on illness and disease. by the time you need them you are no-longer healthy. Do we need them at times in our life. The answer is yes. At times in our life things can go very wrong and we need sick care but lets get it right this is sick care. Health is promoted by lifestyle, diet, exercise, and prevention. Heath is not found in a pill or a surgery. This is sick or emergency care. As Americans we have been sold a bill of goods that health comes in a pill or a bottle and it should be free. The truth is the health costs and takes work to maintain throughout your life. Until Americans understand this and start to pay for health in small amounts thorough there life through hard work diet, exercise and life style it will always require expensive medications and insurances and it doesn’t mater if you pay for it with tax dollars, your dollars, your employers dollars or though a lifetime of hard work and vigilance it will always cost you much. The truth is health care costs in one form or another the great news is that it is worth every penny. If people would understand that they are responsible for their health and not some third party and if they would realize that they pay for it one way or another there would be no health care crises (aka. sick care crisis). The bottom line is you are responsible for your health but most Americans believe it is the health insurance, the pharmaceutical companies, and even their doctors who are responsible for their health. Until america wakes up and realizes they are personal responsible for their health this will never change and the costs financially will continue to go up. It is not directly your fault the message that your health is someone else responsibility has been sent into every living-room for decades but it is time for this to change. See our post on real health care. This is a principal that I have preached for over a decade.We do need sick care in our life but it is time for a paradigm shift and it is time that we understand what real health is and how it works. Health is a gift given to us at birth that must be protected by us it is not a responsibility that can be passed to anther we can ask for help at times but true health is an individual responsibility. 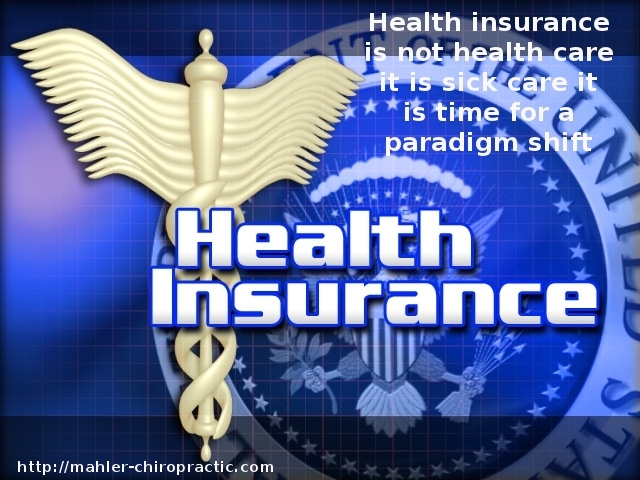 ← Why you need chiropractic wellness care and I mean everyone!